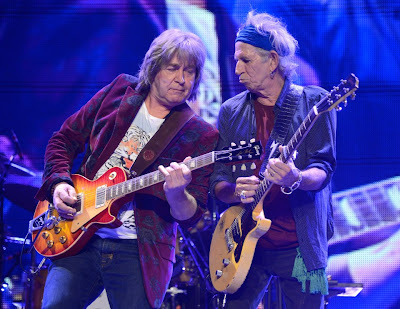 Mick Taylor was front and center as the Rolling Stones returned to Los Angeles Monday night for the seventh stop on their “50 & Counting” arena tour; the band opened the trek at the city’s Staples Center on May 3. For the band’s first show this spring without an outside guest, Taylor’s traditional single-song spotlight on “Midnight Rambler” expanded to four tracks throughout the evening. Taylor played on the fan-voted “Sway” from 1971’s “Sticky Fingers,” before returning to jam out “Can’t You Hear Me Knocking” from the same album. The Stones next show is Saturday in Toronto.